The world’s most powerful new space rocket blasted into the heavens above Florida’s east coast on Tuesday afternoon on a trailblazing deep-space mission that Elon Musk, founder of the private aerospace company SpaceX, believes could spell “game over” for his commercial spaceflight rivals. The spectacular, flame-heavy launch was watched by an estimated half-million spectators who packed the beaches and other key vantage points around Florida’s space coast for the biggest fireworks show since the retirement of Nasa’s space shuttle fleet in 2011. Falcon’s upper stage and test payload, the whimsical touch of Musk’s $100,000 cherry red Tesla Roadster sports car, and a dummy in its driver’s seat called Starman rocking to David Bowie’s Life on Mars, continued, zapping through the Van Allen Belt. Pictures of the car heading into space with the Earth below gave the triumphant launch a surreal quality. From there, it will journey on through a six-month, 400m-kilometre trip to a solar orbit, for more than a billion years. Musk hopes the Falcon Heavy will help with interplanetary exploration and assist the mission of Nasa, the American space agency, as it works towards a return to the moon for the first time since 1972, and eventually landing humans on Mars before the middle of the century. “Falcon Heavy heading to space on our test flight, building on the history of Saturn V/Apollo and returning launchpad 39A to interplanetary missions,” a SpaceX announcer said as the rocket lifted off, referring to the historic launchpad at the Kennedy SpaceCentre from which the first manned moon mission took flight in July 1969. Musk, the billionaire founder and lead designer of SpaceX, who first announced plans for a heavy-lift rocket in 2011 and constructed the Falcon Heavy by strapping together three boosters from the company’s smaller but proven Falcon 9 cargo rockets, had downplayed expectations of a successful launch. On Monday, he had estimated Falcon’s chances at about 50-50, and said he feared a launchpad-destroying explosion similar to the Falcon 9 fireball that created extensive damage in September 2016. But in the same conference call with reporters, Musk said that a problem-free launch of Falcon Heavy would be a game-changer for SpaceX and other commercial spaceflight companies vying for contracts from Nasa, the US military and private enterprise. The only possible downer on the day for Musk was the rumoured loss of Falcon heavy’s third booster, the central core. An hour after the launch, SpaceX was unable to confirm that the booster had landed safely on a recovery barge in the Atlantic Ocean. 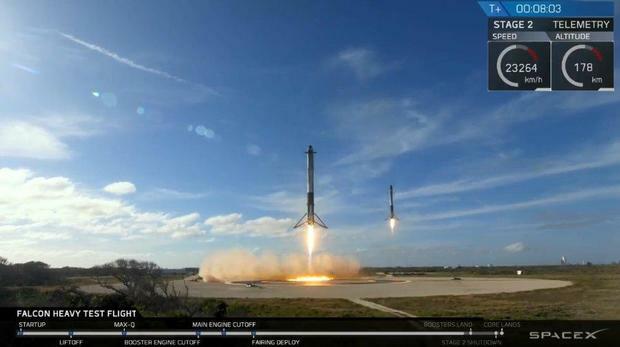 Meanwhile, the two side boosters had landed successfully on land at the space centre, marking the 42nd and 43rd time SpaceX had retrieved a booster for reuse. Spectators who paid $195 each for a ticket packed the bleachers at the Saturn V visitor centre and had a clear view of the launchpad across the Banana river just 3.9 miles away. Parents kept children out of school, and other families travelled great distances to witness the launch. Her husband declared Elon Musk to be “brilliant”. “It’s incredible that not only did he get that rocket up there, but then he lands those two pieces right back on the ground upright, right on the circle. How on earth do you do that? It was spectacular,” he said. Casey Dreier, director of space policy at the Planetary Society, told the Guardian that the excitement of the launch and success of the first stage of the mission would reignite interest in spaceflight. “You see this so often with space, even with the exploratory missions to Mars and Pluto, people feel almost an antidote to the everyday world of social media we persist in, which is so inward-looking and self-referential,” he said. Jerry Carr, an astronaut on the final mission to Skylab in 1973 that brought the curtain down on the Saturn V era, said the launch was “a hummer”, and praised Musk for opening a new frontier in space. MOUNTAIN VIEW, California – SpaceX customers should not expect deep discounts when they opt to launch satellites on previously flown boosters instead of new ones, at least not initially, said Hans Koenigsmann, vice president of build and flight reliability for Hawthorne, California-based SpaceX. Although SpaceX intends to decrease launch costs over time, it will not immediately offer significant discounts on preflown boosters while it recovers its investment in the technology it is developing to make rockets reusable, including its “navy” of drone ships and telemetry boats, Koenigsmann said Feb. 6 at the Small Satellite Symposium here. Plus, there may be no reason to offer steep discounts on rockets with previously flown boosters because “I’m not sure that booster has any wear and tear on it that makes it worse,” Koenigsmann said. Previously flown boosters may prove to be more reliable than new ones, Koenigsmann said. SpaceX designs each rocket for multiple flights and the company has established a comprehensive process for inspecting the boosters it recovers. In addition, if a rocket has flown successfully once that means it was built correctly in the first place, Koenigsmann said. SpaceX has recovered 24 boosters including twelve on ships, eleven on land and one in the water. On Jan. 31, SpaceX recovered the booster used to launch the Luxembourg government’s GovSat-1 even though the booster landed in the water instead of on a drone ship. SpaceX has reflown eight boosters, beginning in March 2017 with the launch of the SES-10 telecommunication satellite. On Feb 6, SpaceX included two previously flown Falcon 9 boosters on the first launch of the Falcon Heavy rocket. SpaceX engineers are learning how to make Falcon 9 boosters more reliable by inspecting the ones they recover. SpaceX also is using that knowledge to improve Falcon 9’s second stage where it shares hardware with the booster. “Reusability improves this booster tremendously,” Koenigsmann said. SpaceX's Falcon Heavy, the world's most powerful rocket, thundered to life and shot away from Florida Tuesday on the power of 27 engines and nearly 5 million pounds of thrust, kicking off a spectacular maiden flight to send founder Elon Musk's cherry red Tesla Roadster on a "just for fun" journey into the asteroid belt well beyond Mars. It was easily the loudest and possibly most dramatic launch from Florida's "Space Coast" since NASA's space shuttle was retired in 2011 with the Falcon Heavy, made up of three strapped-together core stages powered by nine engines each, putting on a dazzling show for tourists and area residents jamming nearby roads and beaches. The central core stage, however, ran out of propellant on the way down and was unable to restart its engines for descent into the lower atmosphere. Instead, it crashed into the Atlantic at about 300 mph, missing the "Of Course I Still Love You" droneship by about the length of a football field, damaging two of the unpiloted ship's thrusters and showering the deck with debris. None of the stages used for Tuesday's flight were to be used again as SpaceX transitions to an upgraded version of the Falcon rocket and recovering the boosters was a secondary test objective. The major goal was demonstrating a new heavy-lift rocket and Musk was thrilled with the mission. "I'm really excited about today, incredibly proud of the SpaceX team," Musk said after launch. "They've done an incredible job of creating what really is the most advanced rocket in the world, the biggest rocket in the world. I'm still trying to absorb everything that happened because it seems surreal to me." Musk tried to downplay expectations before launch, warning that launching a powerful new rocket on its first flight was risky business. "I had this image of a giant explosion on the pad and a wheel bouncing down the road and the Tesla logo landing somewhere with a thud," he told reporters after launch. "But fortunately, that's not what happened. The mission has begun really as well as one could have hoped with the exception of the center core." While the Tesla on board for the rocket's first test flight tipped the scales at a relatively modest one ton or thereabouts, the Heavy has the ability to boost nearly 140,000 pounds to low-Earth orbit and more than 37,000 pounds to Earth-escape trajectories to Mars. 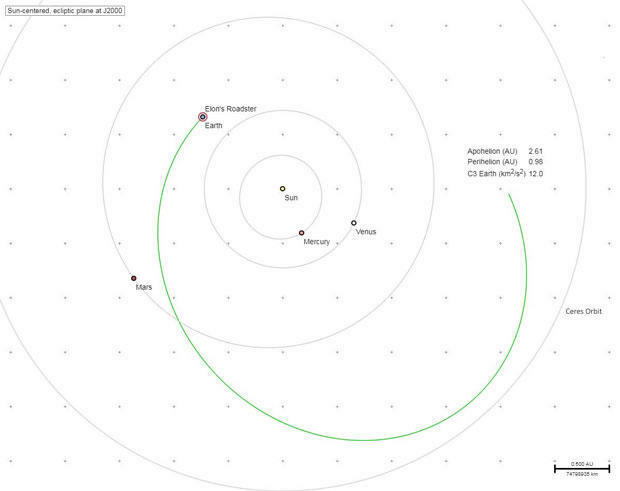 The Falcon Heavy boosted Elon Musk's Tesla Roadster into an orbit around the sun with a high point in the astroid belt near the dwarf planet Ceres and a low point near the orbit of Earth. After a final rocket firing by the Heavy's upper stage, the Tesla had a velocity of nearly 27,000 mph. But the SLS is not expected to fly until late 2019 or later. Until then, the Falcon Heavy will be the world's most powerful rocket, offering a relatively low-cost option for getting heavy payloads into space for NASA, the Department of Defense and commercial satellite operators. U.S. Commerce Secretary Wilbur Ross, who attended the launch at the Kennedy Space Center, said the Heavy offers a promising alternative for heavy weight national security satellites that are too big for the Falcon 9 and currently fly exclusively on more expensive United Launch Alliance Delta 4s. 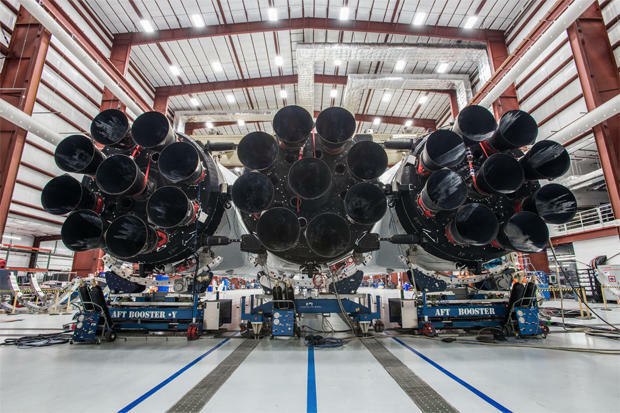 The business end of the Falcon Heavy: 27 Merlin engines, clustered in groups of nine, developing nearly 5 million pounds of thrust at liftoff. "The national security people have indicated that assuming this test or a subsequent one goes well they would plan to use this Falcon Heavy for classified missions," he said. The rocket also could be used to launch astronauts or space tourists to the moon, although plans for such flights are not yet mature. Made up of three strapped-together Falcon 9 first stages and a single upper stage, carrying the Tesla, the Falcon Heavy's engines flashed to life at 3:45 p.m. EST (GMT-5), two hours and 15 minutes late because of higher-than-allowable upper-level winds. After a lightning-fast round of computer checks, the 229-foot-tall rocket was released to climb away from from the pad, shattering the afternoon calm with an ear-splitting roar and an impossible-to-miss rush of fire from all 27 engines, nine at the base of each core stage. Going into the flight, Musk predicted a 50 percent to 70 percent chance of success based in large part on the difficulty predicting how the vehicle would respond to extreme aerodynamic stresses and vibrations from the clustered engines. As it accelerated skyward, aerodynamic forces quickly ramped up, forming an invisible "bow shock" over the nose of the central core stage, creating complex interactions and, possibly, localized heating as the spacecraft picked up speed plowing through the thick lower atmosphere. But the Heavy endured those stresses, rocketing through the speed of sound and the region of maximum aerodynamic stress about a minute after liftoff. The 18 engines in the two outboard core stages shut down two-and-a-half minutes after launch. Both stages then separated from the core booster, flipped around, restarted three engines each and began flying back to Florida. The nine center stage engines continued firing for another 30 seconds or so before they, too, shut down and the second stage pulled away on its own, lighting up a single Merlin engine to continue the boost toward a preliminary orbit. The central core stage then fired three of its engines to set up a landing on the "Of Course I Still Love You" stationed several hundred miles east of Cape Canaveral. The two outboard stages, meanwhile, restarted three engines to slow down for atmospheric entry. The burns -- brilliant side-by-side jets of flame -- were clearly visible across Florida's east coast as the two boosters plunged tail-first toward pads at Landing Zone 1 at the Cape Canaveral Air Force Station. Falling like bombs, the rockets each restarted a single engine to slow for touchdown, each one deploying four landing legs. Falcon Heavy side cores touching down at SpaceX's Landing Zones 1 and 2, about 8 minutes after launch on Feb. 6, 2018. Heralded by dual sonic booms that thundered across Cape Canaveral, both boosters touched down about eight minutes after liftoff. But the central booster didn't make it to the droneship. "Apparently, it hit the water at about 300 mph and took out two engines on the droneship," Musk said. "We've got the footage. It's some pretty good footage! If the camera's didn't get blown up as well, then we'll put that out. We weren't going to reuse that center core anyway." A few moments after the booster landings, the second stage engine shut down putting the rocket and Musk's still-attached Tesla Roadster into a preliminary orbit. A second engine firing 20 minutes later put the stage and its Tesla payload into an elliptical orbit with a high point of 4,319 miles and a low point of 112 miles. Live video from the spacecraft was streamed on YouTube throughout the afternoon, showing the Tesla, its space-suited mannequin "Starman" in the driver's seat and a sign reading "Don't Panic" on the dashboard where the car's computer screen would be. The video showed the Roadster slowly rotating against a backdrop of deep space and the brilliant blue planet below, spectacular images that made the stream one of the most watched in YouTube history. But at that point, the Tesla was still firmly in the grip of Earth's gravity. A third rocket firing late Tuesday night boosted the Tesla's velocity to some 25,000 mph, fast enough to escape the pull of Earth's gravity. In fact, the burn was more successful than originally planned. SpaceX engineers initially calculated the Tesla would end up in an orbit around the sun with a high point around the distance of Mars' orbit and a low point close to the orbit of Earth. But the second stage apparently fired longer than expected, boosting the Roadster into a solar orbit with a high point in the asteroid belt well beyond Mars. "We estimate it'll be in that orbit for several hundred million years, maybe in excess of a billion years," Musk said before launch. Tuesday night, he tweeted: "Third burn successful. Exceeded Mars orbit and kept going to the Asteroid Belt." 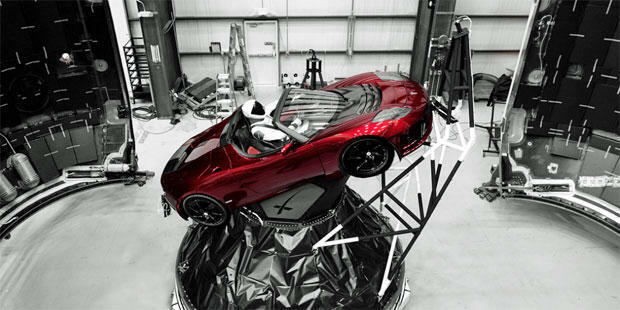 The Tesla Roadster mounted atop the Falcon Heavy's upper stage included a mannequin known as Starman strapped in the driver's seat, its left arm causually draped over the door. The Tesla took the place of what SpaceX founder Elon Musk called a more "boring" mass simulator for the Heavy's first flight. New rockets making their first flights typically carry dummy payloads, or "mass simulators." But not the Falcon Heavy. "It's just for fun," Musk laughed in an interview. "A lot of people (wondered) what's the purpose of sending a car to Mars? There's no point, obviously! It's just for fun and to get the public excited. Musk believes the Falcon Heavy, which at $90 million a copy costs much less than ULA's less-powerful rockets or the European Ariane 5 booster, is a potential game-changer for SpaceX. But first, the company must demonstrate the Heavy's reliability. And it's not yet clear how the Falcon Heavy figures into SpaceX's long-term plans, whether enough customers, including NASA, will buy the Heavy for commercial satellite-launching missions, to send interplanetary probes into deep space or possibly to send space tourists into orbit aboard a piloted version of SpaceX's Dragon spacecraft. "I think Heavy creates a lot of opportunities," said John Young, an engineer on a SpaceX advisory board. "There are several communities in Washington that would love to have a bigger aperture, either optical or radar, to collect more (national security) data, so this creates a whole new opportunity." But it's unclear how SpaceX's efforts to develop an even larger rocket, known as the BFR, will affect its near-term plans for the Heavy. Musk said last year the Heavy would be used to launch two paying customers on a flight to loop around the moon by the end of this year, but that mission is on hold. "The Falcon Heavy is definitely capable of sending the crewed Dragon vehicle around the moon," Musk said. "We may still do that, it depends on how quickly the BFR. development goes. If that development's looking good, then we will try to push everything to BFR. If that's looking like it's going to take longer than expected, then we'll send people around the moon using Falcon Heavy and Dragon."" But the BFR is the clear focus, a rocket system that he says will be "ideal for interplanetary colonization and for establishing a large base on the moon and a city on Mars. But this (the Falcon Heavy) is a prelude to that, this is going to teach us a lot about what's necessary to have a huge booster with a crazy number of engines." For now, the Heavy remains a rocket under development. SpaceX's bread and butter comes from satellite launches using the Falcon 9 and it has a $10 billion manifest. SpaceX also holds NASA contacts valued at more than $2 billion for 20 space station resupply flights and a subsequent contract covering another six cargo missions. The company is building a piloted version of its Dragon capsule to ferry astronauts to and from the station under a separate $2.6 billion contract and the company recently won a second long-term station resupply contract, with an unspecified value, for another half-dozen resupply missions. MERRITT ISLAND, Fla. -- America's private space program made another giant leap Tuesday when a giant SpaceX rocket, named Falcon Heavy, blasted off from the launch pad once used in the moon missions. And new dreams of astronauts exploring deep space were reignited. The Falcon Heavy, the most powerful rocket in the world, lifted off and streaked across the sky as it climbed toward outer space. The roar of its 27 engines was matched only by the crowd. But the show in the sky wasn't over. The rocket's boosters detached, and minutes later, two of them could be seen descending back to Earth. They landed in tandem near the launch site. SpaceX founder and CEO Elon Musk said the center booster of the Falcon Heavy missed a floating landing platform and slammed into the Atlantic at 300 mph. The payload -- a Tesla Roadster carrying a dummy named "Starman" -- hurtled away from Earth and toward a planned orbit of Mars to the sounds of David Bowie's "Life on Mars." The Falcon Heavy combines the power of three rockets into one that can carry bigger satellites and equipment -- and eventually humans -- deeper into space. "The mission went as well as one could hope ... it's the most exciting thing I've ever seen," Musk said during a news conference Tuesday night. He mentioned that the two side boosters that landed back in Florida are in good condition and are both refireable. But, notes CBS News space analyst Bill Harwood, none of the stages used for Tuesday's flight were to be used again as SpaceX transitions to an upgraded version of the Falcon rocket and recovering the boosters was a secondary test objective. The major goal was demonstrating a new heavy-lift rocket. When asked what Falcon Heavy taught Musk: "It teaches me ... crazy things can come true. I didn't really think this would work ... when I see the rocket liftoff I think of the thousands of things that could have gone wrong and it's amazing when they do [work]. The two boosters landed just like the simulation ... there could be a really scalable approach ... It gives me a lot of faith for the next architecture ... It gives me confidence that the BFR is quite workable." "Falcon Heavy has the same flexibility of Falcon 9 ... even though it has three times the capability," Musk added. "The cost between Falcon 9 and Falcon Heavy is minor." Musk mentioned that the Tesla Roadster launched in space is a normal car and he said if you look closely on the dashboard, there's a tiny Roadster with a tiny "Spaceman." He said it's kind of silly and fun, but that's important. He joked that an alien may find the Roadster and wonder, "Hmmm, did they worship this car?" as the reporters in the room laughed. "Falcon Heavy opens up a new class of payload ... it can launch things to Pluto and beyond, no stop needed," he added. SpaceX engineers initially calculated the Tesla would end up in an orbit around the sun with a high point around the distance of Mars' orbit and a low point close to the orbit of Earth, reports Harwood. But the second stage apparently fired longer than expected, boosting the Roadster into a solar orbit with a high point in the asteroid belt well beyond Mars. Tuesday night, Musk tweeted: "Third burn successful. Exceeded Mars orbit and kept going to the Asteroid Belt." "You know all the ways it could fail ... I've seen rockets blow up ..." Musk answered a question about his pre-launch jitters. Musk spoke earlier about the possibilities with Harwood. "You could actually send people back to the moon with the Falcon Heavy," Musk said. "You could, with interplanetary fueling, send people to Mars." Musk's goals are to leave his mark -- and his brand -- on space travel. "We're just trying to make space exciting again and trying to push the frontier back where it was during the good old days," he said. SpaceX is expected to update the progress of its mission later Tuesday evening, since it's not over yet. The rocket's final phase involves igniting one more time in order to thrust the car and "Starman" into their intended orbit. CAPE CANAVERAL, Fla. — SpaceX’s triple-barreled Falcon Heavy rocket rose into space today for the first time on a pillar of flame and clouds of exhaust, blending the serious and silly sides of spaceflight. And to top it all off, two of those three rocket barrels landed back on Earth intact after the launch. More than 2 million people watched SpaceX’s live video stream, which showed the launch and the landings as well as hundreds of employees cheering at the company’s headquarters in California. Liftoff from the historic Launch Complex 39A at NASA’s Kennedy Space Center in Florida, where Apollo moon rockets and space shuttles once began their trips into space, came at 3:45 p.m. ET (12:45 p.m. PT). The launch occurred more than two hours later than originally planned, due to upper-level winds that had to die down before the go-ahead was given. The test launch marked a serious step forward for SpaceX, which can now lay claim to having the world’s most powerful operational rocket. But its payload was as silly as it gets: a red Tesla Roadster sports car, owned by SpaceX CEO Elon Musk (who also happens to be Tesla’s CEO). The Roadster, with a spacesuit-clad “Starman” mannequin in the front seat, was packed inside the Falcon Heavy’s nose cone because Musk didn’t want to risk putting a valuable spacecraft on a test flight that could have gone horribly awry. David Bowie’s “Life on Mars” provided the soundtrack as the car and Starman were exposed to the vacuum of space. “DON’T PANIC,” the classic advice from humorist Douglas Adams’ “Hitchhiker’s Guide to the Galaxy,” was displayed on the Roadster’s dash screen. The car is heading for a deep-space orbit looping out well beyond the orbit of Mars. “We estimate it’ll be in that orbit for several hundred million years, maybe in excess of a billion years,” Musk said. At least two other items of note were placed on board as payloads: a commemorative plaque that bore the signatures of 6,000 SpaceX employees, and a “data crystal” containing a digitized library that includes Isaac Asimov’s Foundation Trilogy. This first Falcon Heavy was the result of years of development work, and combines three first-stage rocket cores for SpaceX’s workhorse Falcon 9 rocket. Two of the tall, cylindrical cores were used in previous launches and refurbished for today’s test. The center core was previously unflown. The three first-stage cores bristled with 27 of SpaceX’s Merlin rocket engines, providing 5 million pounds of thrust at liftoff. They powered the world’s most energetic rocket launch since 2011, when Atlantis blasted off on the space shuttle fleet’s last mission with nearly 7 million pounds of thrust. Minutes after liftoff, all three of the Falcon Heavy’s cores separated and headed back to Earth for recovery — two by land and one by sea. 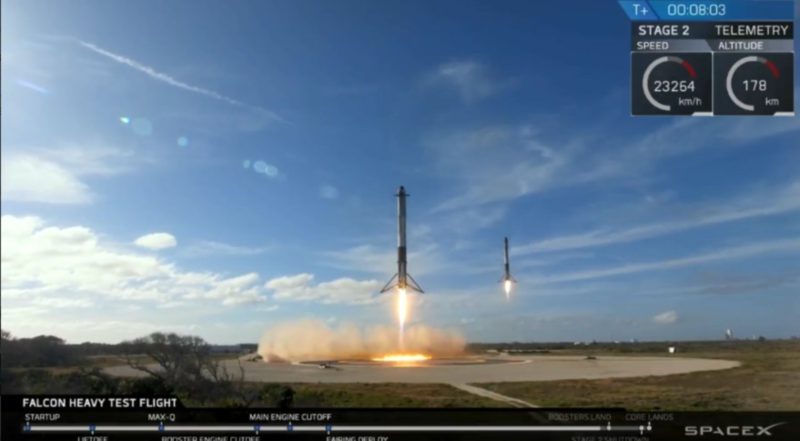 The two side cores landed successfully at SpaceX’s Landing Zone 1 and Landing Zone 2, not far from the launch site, heralding their arrival with a pair of sonic booms. A drone ship named “Of Course I Still Love You” was on hand in the Atlantic to serve as a floating landing pad for the center core. Webcam videos showed the rocket core making a blazing descent, but it missed landing on the ship. Musk said the center core wasn’t able to summon enough power for a controlled landing because it ran out of the triethylborane fuel used to restart its engines. Meanwhile, the Falcon Heavy’s upper stage executed two firings of its single Merlin engine, putting it on course to coast for five hours through the intense radiation of Earth’s Van Allen belts. At the end of that perilous phase of the flight, it fired its engine for a third time to send the Roadster and its dummy driver to deep space at a speed of nearly 25,000 mph (11 km/sec). Eventually, SpaceX plans to use the Falcon Heavy to put large satellites, or combinations of satellites, into Earth orbits ranging as high as 22,000 miles in altitude. It could also take on missions to the moon or Mars — although Musk says that an even more powerful launch vehicle currently under development, nicknamed the BFR or “Big Falcon Rocket,” would probably be more suitable for interplanetary trips once it’s ready to go. This report was most recently updated at 9:34 p.m. PT Feb. 6. CAPE CANAVERAL, Fla. — Today’s maiden voyage of the SpaceX Falcon Heavy rocket was epic, historic and loud. You can read more about the launch and learn all about the rocket’s very unique payload. Our cameras captured the launch from a variety of vantage points on a warm, sunny afternoon on Florida’s Space Coast. Some of the shots were captured from the roof of NASA’s gigantic Vehicle Assembly Building. Other cameras were placed near the launch pad at Kennedy Space Center a day ahead of time and activated automatically by the sound of the rocket. There’s a beauty behind all the fire, smoke and noise of a rocket launch and landing — as these photos illustrate.